It’s about this time every year that I start to go through and put together at least a few fun new gameday recipes. 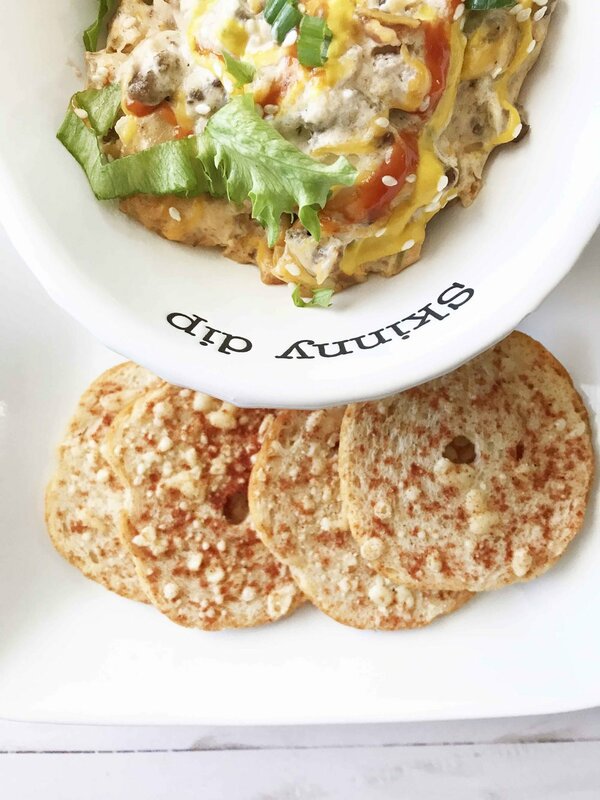 And this Skinny Bacon Cheeseburger Dip is topping the charts. Now, I know what you might be thinking… Cheeseburger as a dip? Well, why the hell not? I’ve made a cheeseburger into a salad before, so why not a dip?! This dip starts the same way that any good dip does… with plenty of cheese and layers upon layers of flavors. This dip is lightened up by using a lean ground beef and substituting in some low-sodium center cut bacon. After that, it’s plenty of reduced fat cheeses and all the toppings that you’ll find on any traditional cheeseburger. Ketchup, mustard, onion, pickles, and of course… sesame seeds! One of the nice things about this dip is that it’s hearty and completely loaded with plenty of good stuff. It’s dipable and scoopable with most veggies and the like. But celery, romaine hearts, and bagel chips were my personal favorites! I added plenty of garnishes on top to really make this dip feel like a cheeseburger. So, all the ketchup, mustard, green onions, lettuce, and sesame seeds that a person could want in a burger. Oh… and don’t forget about the bacon! A fully loaded cheeseburger dip that's complete with all the fixins'! Bacon, cheese, onion, beef, and so much more. This is the perfect way to enjoy a cheeseburger on gameday! • Optional Garnishes: Mustard, Ketchup, Green Onions, Sesame Seeds, Chopped Lettuce, Etc. Brown the meat in a medium skillet over a medium-high heat until cooked through. Drain off any excess fat. 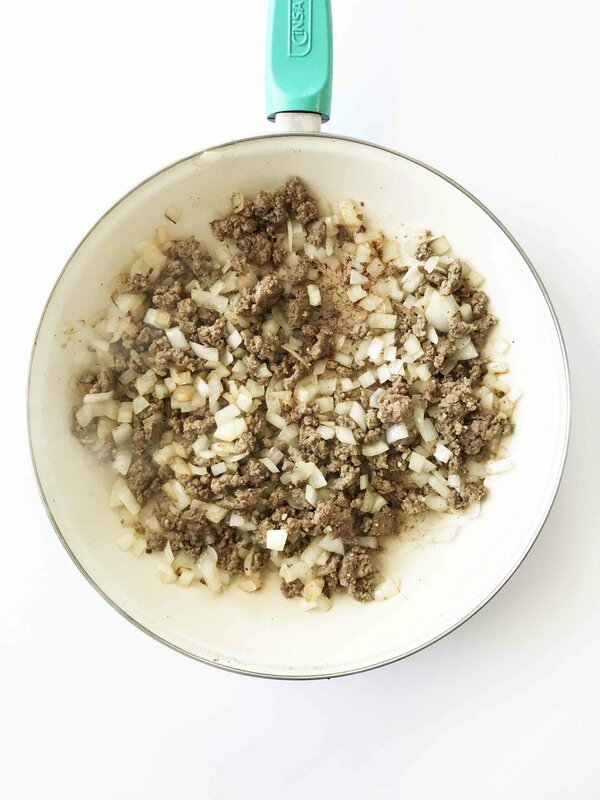 Add in the chopped onion and 1 minced garlic cove and continue to cook until the onion is tender; set aside. In a large bowl, beat together the 4 Oz. cream cheese, 1/2 C. greek yogurt, 1/2 C. mozzarella, 1/4 C. cheddar, 1/4 C. mayo, 2 Tbsp. ketchup, 1 Tbsp. Worcestershire, 1 Tbsp. relish, and salt & pepper to taste. Add in the cooked meat an onion mixture and the cooked bacon and stir to combine. Transfer the mixture into a serving dish and sprinkle the remaining 1/4 C. of cheddar over the top. Cover with foil and place in the oven to bake for 20-30 minutes or until the cheese has melted and the dip is hot. Once done, remove from the oven and top with any desired garnishes. Serve right away with your choice of dippers!